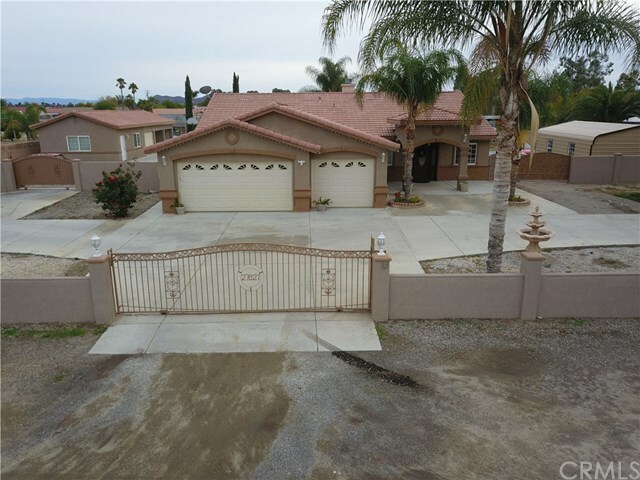 27627 Benigni Avenue Menifee, CA. | MLS# SW18281187 | Temecula, Murrieta, Menifee Homes for Sale & Property Management! Beautiful custom built home on over a Acre features 5 large bedrooms 4 bathrooms living room dinning room open spacious family kitchen combination. Beautiful custom cabinets granite counters and stainless steel appliances. This home is perfect for a large family or someone who has a mom or dad living with them. It has a granny house with a living room kitchen bedroom and bathroom. Detached 4 car storage shed plus detached 2 car garage......this does not include the 3 car garage attached to the home. Hugh covered patio with gazebo perfect for family get togethers! circular driveway custom wrought iron electric opening gates with block wall fencing front and side yards....LOW LOW LOW PROPERTY TAX!